Mentioned is the way you can write Security Sales Manager CV Template. 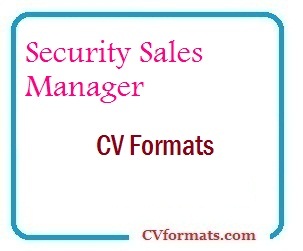 People looking for jobs can easily download these Security Sales Manager CV formats in editable pdf and MS-Word (.doc) formats or you can just copy and paste from or website CVFormats.com and app. Cover letter of Security Sales Manager CV Template is also available. Just change the name , address , qualification and experience and your Security Sales Manager CV Template is ready. 2015- 2018 Security Manager (Sales) GHT security services. Achieving assigned revenue goals by establishing new customer relationships and maintaining and growing existing accounts. Maintaining knowledge of competitor’s products and explaining to the customers the advantage of GHT services over competitors’ services through face to face interaction and presentations. Developing an understanding of target customers and developing projects accordingly. Working closely with security consultants and others to fulfill the client’s requirements. Developing sufficient customer knowledge to be effective in helping customers with their problems. Maintaining relationships with existing accounts to build additional business. Managing the proper use of all corporate resources. Resolving customer complaints and concerns as effectively and quickly as possible and forward such issues to the appropriate management. Have built up a strong customer base for GHT security through networking and constant interaction.